Licence for up to 12 persons. Smaller groups welcomed and individuals also catered for. For day trips, boat departs Rossaveel around 9am and returns around 5.30pm. For evening charter, boat departs at 6.30pm and returns approx at 9.30pm. 45 min drive from Galway. Une dernière photo de requin hâ pour l’année 2018. J’en profite pour remercier tous ce qui sont venus pêcher avec moi et Chris sur le Leaca Rua ou sur le Bun na Speire dans la baie de Galway!. "Une superbe journée en mer grâce à l'ami Maxime Couque qui nous a sorti pour une pêche mémorable! Nous avons pêché des maquereaux et du lieu jaune. Sommet de la sortie, nous avons mangé les maquereaux grillés au barbecue sur le bateau ! Et comme il y avait encore une surprise, les phoques nous ont suivis lors de notre retour au port. ON N’EST PAS BIEN LÀ !!! Inoubliable journée avec 12 requin hâ, 11 aiguillat, une grande roussette et une multitude de roussette. Le 3ème jour consacré aux requins, magnifiques souvenirs à faire et à refaire. je n'ai céssé de féliciter Max Couque, sa femme Titiane et ses deux charmantes filles Oceane et Marine (pour des filles de pêcheur, ça s'invente pas). Max est un guide hors pair qui sait nous faire découvrir les bons coins dans sa baie. Tout ça sans compter le soleil qui a eté de la partie sur tout notre séjour. Après 3 semaines de soleil, j'ai décidé d'emmener ma fille Marine à la pêche et comme d'habitude elle nous a sorti le plus gros Lieu Jaune de la journée et du début de saison. 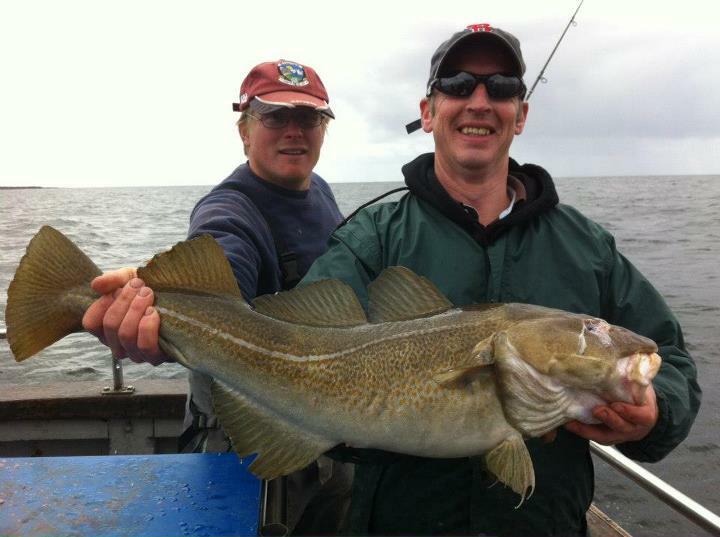 A nice 13lbs cod caught by Christian Verdière and below his report of the week, Thanks to Christian! Pour un pêcheur, il y a une attente première, celle de prendre du poisson. C’est le cas avec l’ accompagnement professionnel de Max. Mais dans le bateau de Max, il y a plus. Convivialité, bonne humeur et éco responsabilité. Trois notions qui font que l‘on passe des journées intenses et exceptionnellement passionnantes. A nice day spent with Laura Miskell and her Family, find below her report, thanks Laura! "Have to say a big thank you to Maxime Couque. What a thoroughly enjoyable day we had on Monday. Weather was gorgeous and the fishing was brilliant. You made me and my children feel so welcome. My kids had different abilities the youngest wanted to do it all, put on the bait, remove the fish from the hook and even dispatch the fish and the eldest just wanted to cast and catch the fish. You accommodated for all our abilities. Please click here to see the photos taken by Laura during this beautiful day. 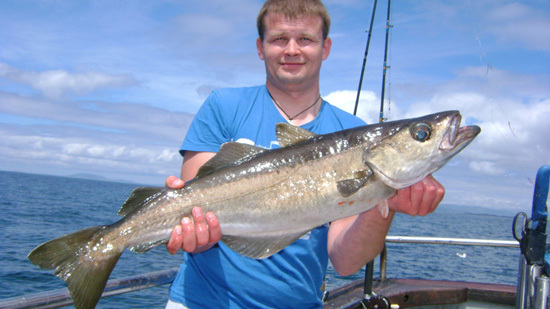 A huge ling of 17 lbs caught by Joachim Hartel and a lovely day with a lot of Pollock. To celebrate this trophee, we went for a pint on one of the Aran Island. A team of 8 fishermen spending a week fishing in Galway Bay. They rented two cottages in Carraroe. Four days fishing and many pollock caught as you will see in the video. If you are looking for an accomodation click here. Brilliant weekend as usual with the Dalys and Friends from Tullamore. 14 species, 15 cod, biggest 5 lbs caught by Neville, two ling, biggest 5 lbs caught by Willie, highest number of species per person: 11 Willie was the highest, a lot of spurdog caught by Philip around 17 lbs, plenty nice Pollocks during the two days and 5 tope, two were measuring 1.3 meter, biggest caught by Colleen our winner of the week end! 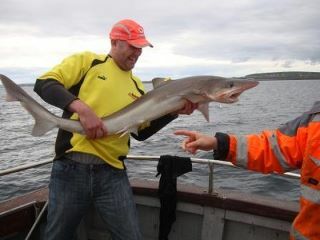 Please click here to see the photos taken by Galway Fishing. 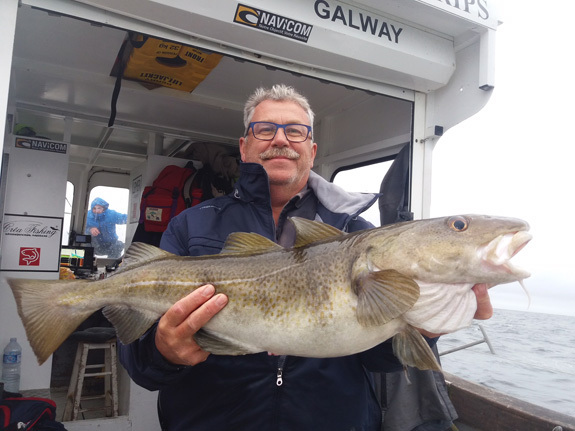 André Rieul, a good customer of Galway Fishing for many years, caught the biggest cod this year, 9 lbs. Many pollock caught also that day. 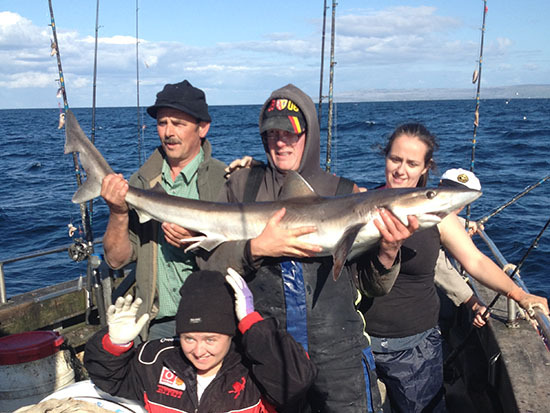 Please click here to see the photos taken during 2013 by Galway Fishing. 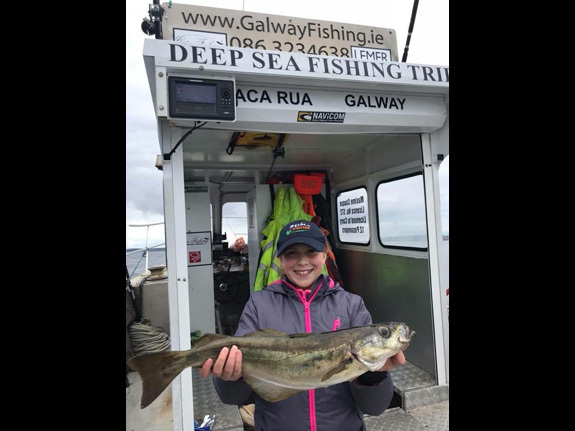 The glorious weekend weather brought our group of 11 anglers from Dublin down to Rossaveel for a day’s charter with Skipper Max Couque on his boat the Leaca Rua. It was our second charter with Max after our very successful trip last August in which we landed 8 species including a smashing John Dory. Despite the hot weather and intense sunshine, Max landed us on some very good Pollack and Coalfish action over a number of drifts. 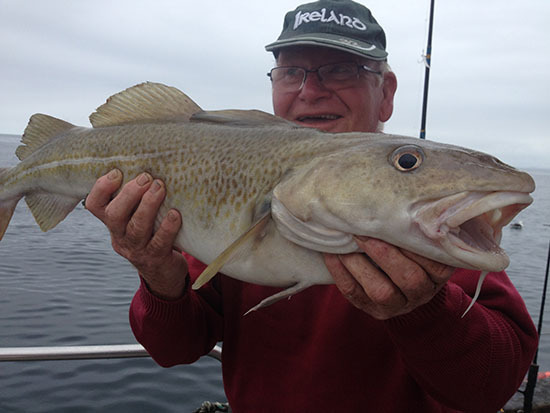 The highlight of the morning session was a mint condition 9.5lb Cod landed by a very happy Robert O’Driscoll from Dublin. 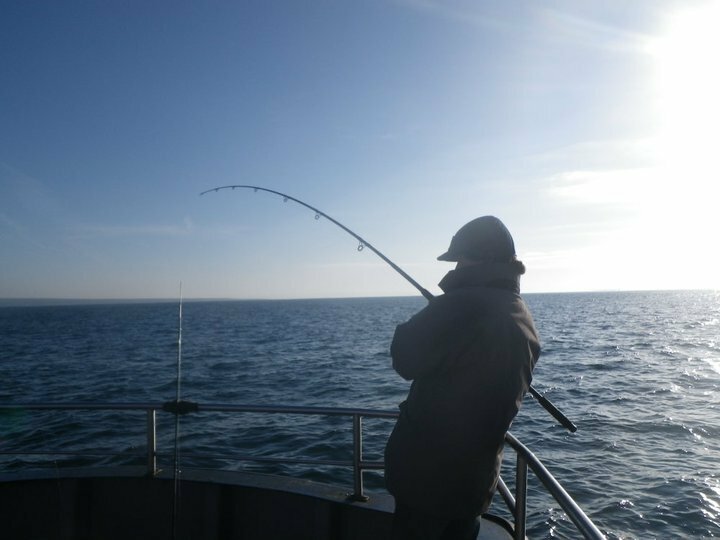 In the afternoon we moved to a drift between two of the Aran Islands and the action continued with more Pollock and Coalfish coming aboard with some Codling and a solitary Pouting even making an appearance. The lack of Mackerel stopped us from ledgering for larger species such as Tope, Ray and Spurdog but we felt it was best to leave some fish in the Bay for next time. The afternoon was topped off with a BBQ on the boat with our catch of the day cooked to perfection. 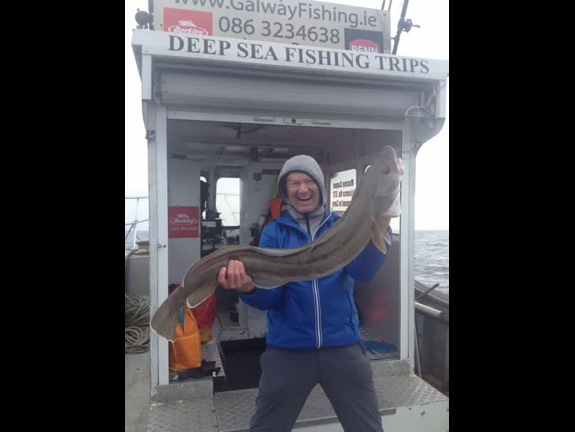 Thanks again to Max for giving us our second fish-filled day out on Galway Bay and we look forward to arranging our next trip on the Leaca Rua. 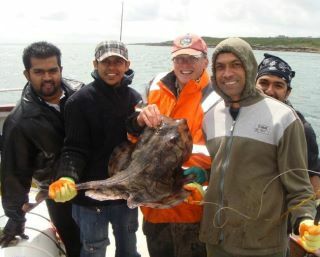 Please click here to see the photos of this sea fishing report in Galway Bay. plenty pollock, few mackerel and a nice 6 pound cod. Some good mixed fishing during the week when I took out a group from Dublin. Fishing the back of Inis Óirr Island we had a fine John Dory followed by plenty pollack. In total the group had eight different species including pollack, John Dory, red gurnard, poor cod, dog fish and ballan wrasse. Mackerel appeared quite early this season and were plentiful from April until June, while they seem a bit harder to get lately. 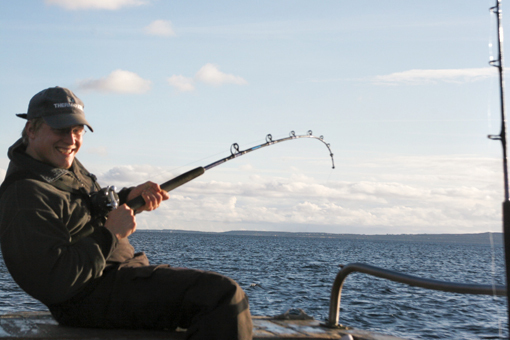 Some of his guests enjoyed good pollack and cod fishing this season. The heaviest pollack of 10 lbs., so far, this year was caught by French angler Jean Claude, while Tom Kiley boated a very nice 12 lbs. cod last week. 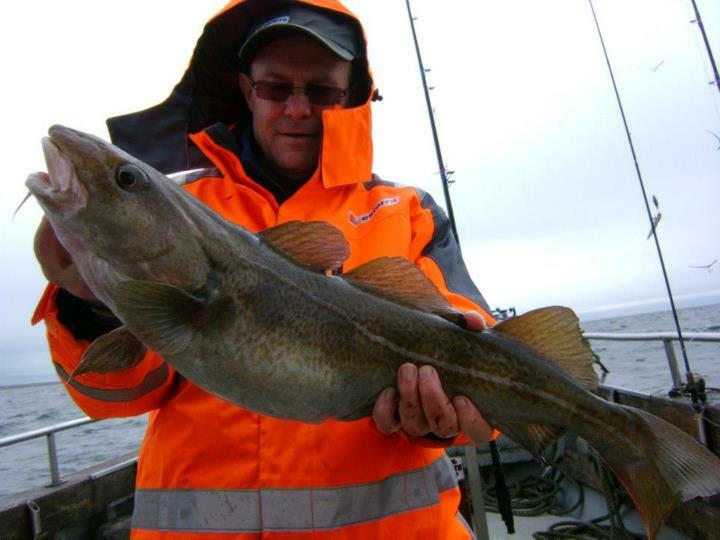 Very good day, with 8 cods, few pouting and plenty pollock, the pollock on the video is around 4 kg. This season is coming to an end. It has been a difficult one, the weather didn’t help us, but the fishing was very good. Pollack still our main target, the biggest was around 11.5 lb. 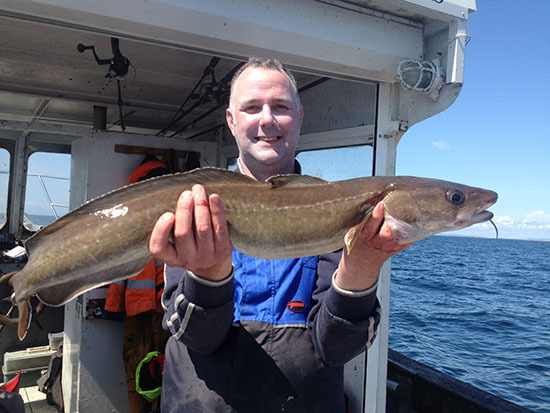 Cod is coming back in good numbers in Galway Bay, is it the weather or this quota system? Who knows! 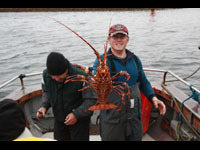 We caught more than 20 species this year, the unusual one was a crayfish. A lot of Spurdogs were caught and released, all females as always. 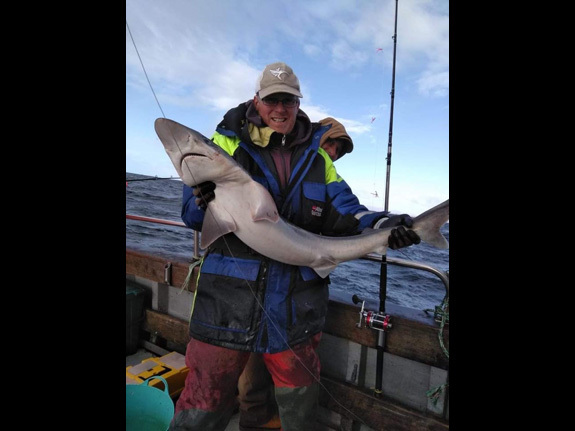 The weather didn’t give us many chances to target Tope in the middle of the bay or Blue Shark outside the Aran Islands. We got three nice Topes but no Blue Shark or no Porbeagle Shark. Not only the weather let us down, the numbers of mackerel also. It has been the first year that I saw such a few numbers of mackerel in the summer. In October and November we had to catch the Joey mackerel for bait. 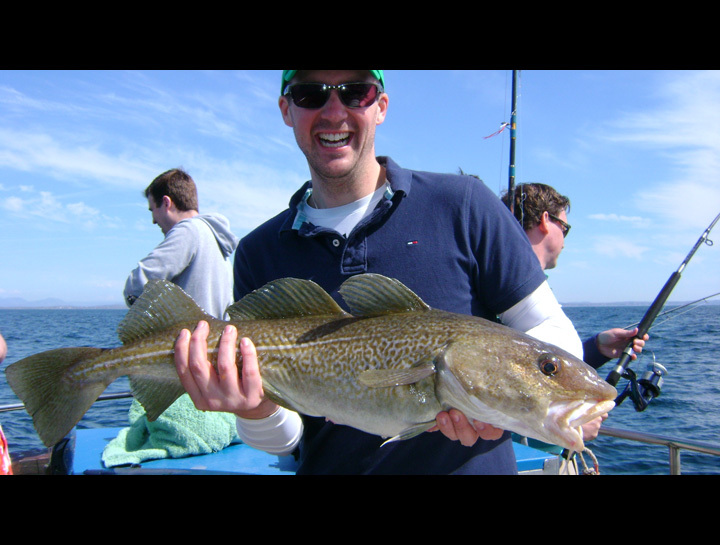 Galway Fishing still available during the winter subject to the weather. I’ve just returned from another great trip in the magical place of Galway. I spent 3 days aboard Leaca Rua skippered by Max Couque catching a large variety of species. Day One I decided to take the Mrs afloat on a ‘half day’ excursion, so Max thought it would be fun if we dropped her straight in at the deep end and we went to Greatmans Bay for tope, ray and bull huss with a few stops on the way to fish for mackerel and pollack. Fishign was very successful with all species apart from the tope. We got plenty of thornback ray (the Mrs bagging the biggest of around 4lb!). Can safely say the Mrs was hooked! Day Two I took my 3 young children, with the Mrs tagging along for another ‘half day’ trip. With my youngest only being 7 years old I asked Max if we could take it easy, so again we went to Greatmans Bay and caught all the usual suspects in abundance again. The Mrs again caught the biggest Ray! Now Day Three, a ‘full day’, with no kids or wife, just me, my stepdad Dave, Sean (on holiday from Dublin) and of course Max. I’d asked Max to get me a nice tope, and he said he’d see what he could do. We got enough mackerel and we headed further out towards the Aran Islands. We drifted across one of Max’s favourite marks and within 40 minutes my line took off. What resulted, after a bit of a battle was a beautiful 30-35lbs male tope, which was brought on board, tagged and released perfectly. My first ever tope and hopefully not my last. Magic! With the tide turning we decided to head off and have some fun pollack bashing on light spinning rods. We easily landed around 30 or 40 of these magnificent fighting fish ranging between 3lbs to 9lbs. Most were returned to fight another day with a few kept for the table. 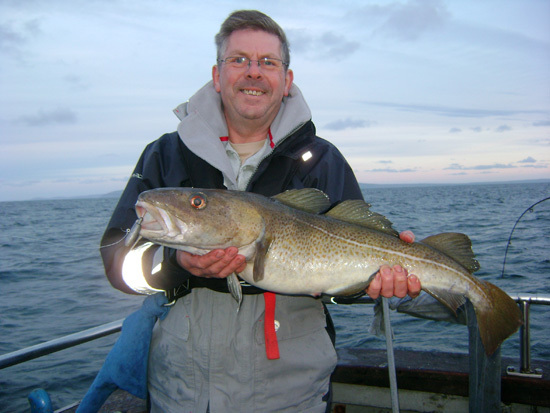 Dave was also pleased to see a nice cod come aboard. It was now getting late so I asked Max if there was any chance on the way back of trying for spurdog, a shark I was very successful with over the last few years in Galway. Max obliged and off we went. Within 20 minutes I had landed a nice 10lbs male spurdog, but Dave had to outdo me with a beautiful 15lbs female a few minutes later. Sean unfortunately couldn’t get one to take. And that was it, another fantastic trip over. The highlight being my tope, for which I thanked Max with a few pints of the dark stuff, Guinness! Great trip, great boat and great skipper. Galway Bay has been very good lately. The Pollocks are getting more and more aggressive, we are catching several cods each trip and a few nice lings are coming up. It has been very difficult to fish for spurdog because of the weather, but every time the two boats tried, we were very successfull. Mackerel are good some days and hard to catch some other days. They are probably waiting for the good weather like us! 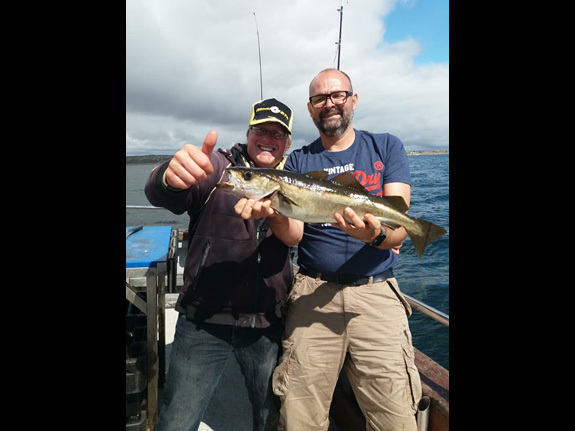 Last week I went fishing with 5 lads, the weather was great, we were fishing around Inish Meain, we caught 10 species (mackerel, sandeel, pollock, haddock, blonde ray, cod, pouting, cuckoo wrassse, coal fish and red gurnard). On the way back, we tried for tope, but no luck, instead a nice 7 lbs blonde ray got caught by Diederik Wienen from Utrecht, the Netherlands. The weather was north west all week end, so we didn't go fishing around the island, we stayed close to the north shore and went fishing for ray. Plenty nice thornback ray caught, dog fish and bullhuss also and a nice 8lbs 7oz Undulate Ray (my first one!) caught by Sujit Rampersand from Mauritius. 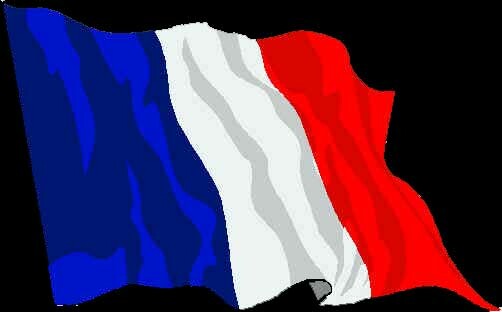 This month of May is now finish, it was a very difficult month with this horrible weather. The mackerel are now in Galway Bay and it is giving us the option to go after species. On saturday Kevin and myself were out fishing around the Island, Kevin had a stag party and I had a group of polish lads who come every year. We had a good da......y fishing, plenty pollock got caught, the biggest around 7... pound and between the two boats we manage to catch 3 cods around 4-5 pounds and 10 species (pollock, cod, mackerel, dogfish, sandeel, ling, pouting, grey gurnard, coal fish and coco wrasse). I had a group of french lads at the beginning of the month when the weather was fine. We had a very good day, no wind and plenty sun shine. 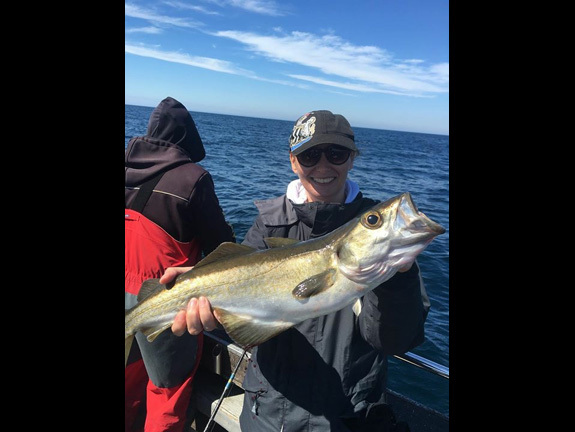 The fishing was great, we were fishing with lures all day, we caught around 60 nice size pollock (average weight 2.5 kg), we released back a lot of them, and 9 cods, the biggest one was 5 pound. 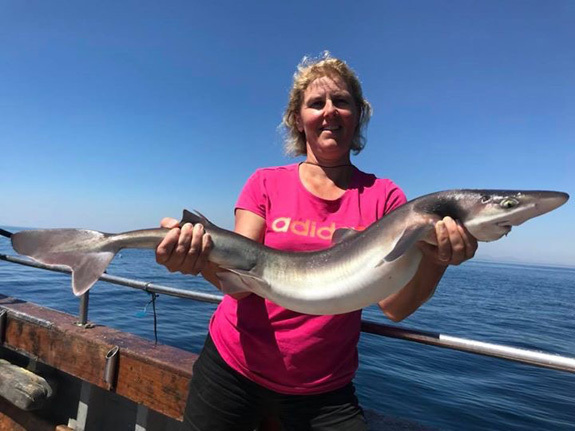 There was a young angler on the boat called Francois Appert and he was talking about shark fishing all day, so I decided to go fishing Spurdog. We caught three in total and Francois got two, one of them was around 12 pound, Francois was delighted and didn't stop talking about it! May is now finish and we are all hoping that the good weather will come back quick! First trip of the year in Kevin’s boat fishing with Alan, Cian, Eamonn and Kevin of course. We were fishing at the back of Inishmore. The wind was easterly, very low in the morning and growing in the afternoon. We were ready for that day, couldn’t wait. Alan brought some small sandeels and some razorfish mixed with mackerel (Alan’s recipe). I brought around 10 mackerels and some small squids fro...zen. All type of lures, jig head and feathers were available for a good day. We started the day with a drift of one hour, starting at around 20 meters finishing the drift at 50 meters. Colored feathers, baited feathers, jig head, jig head with mackerel were working very well. 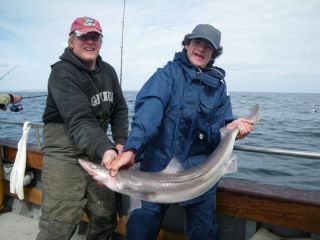 On this drift we got few Pollocks, the biggest around 6 pound caught by Kevin and one four pound cod, very good start. Then we went for another drift, same, few nice Pollocks, the biggest around 7 pound caught by myself and two cods around the three pound. Then Kevin spotted a nice ledge on the sounder and decided to anchor on it. A bit of competition was on between Kevin, Alan and my self for the biggest fish. Cian and Eamonn were catching some nice Pollock on the lure when Alan was catching some species: one cuckoo wrasse, some pouting and a nice Bullhuss. We were all hoping for a nice ling, but no luck. Kevin finished the day with an eight pound Pollock. You can imagine the slagging going on. Great day!! Explore the waters of Galway Bay and Aran Islands with skipper Max Couque and Chris Folan on board 38ft Leaca Rua and on board 35ft Bun na Speire.